Uranus Crosby thought big. Perhaps it came from being named after a planet. He decided Chicago needed a suitable venue dedicated to grand opera, so in 1865 he began building one. Located on Washington Street west of State, Crosby’s Opera House cost $700,000 to construct. The grand opening was set for April 17, 1865, but was delayed three days because of President Lincoln’s assassination. When the performances finally got going, business was bad. Crosby had evidently misread the city’s desire for opera. So Crosby devised a plan to recoup his fortune. He’d give away his opera house and its artwork in a lottery. Now the Crosby Opera House Art Association was formed to conduct the lottery. Rather than think they were gambling, patrons were encouraged to believe they were promoting culture. For a $5 donation you received an engraving of a famous painting. Almost as an afterthought, a lottery ticket and an illustrated catalogue of prizes went along with the engraving. The drawing was scheduled for October 11, 1866. Then Crosby announced it would be delayed two months. He said the demand for tickets made him extend the deadline. More likely, he simply hadn’t sold enough of them. The new drawing was to be on January 21, 1867. In the meantime, the public was invited to visit the Opera House to examine the treasures they might soon possess. Crosby finally sold a total of 210,000 tickets. On the morning of January 21, special trains brought ticket-buyers into the city for the big event. The crowd spilled out of the Opera House itself and onto the street. Extra police were on hand to keep order. Crosby had enlisted distinguished citizens to perform the drawing. At precisely 11 a.m., the first ticket-number was pulled out of a drum on stage. Then a prize ticket was pulled out of a second drum, and matched with it. This went on until 112 pieces of art had been awarded. Then it was time for the big prize—the Opera House itself. Ticket #58,600 was pulled, but the winner was not present. The drawing then resumed until all the other prizes were accounted for. Who had won the grand prize? The Tribune wondered whether the whole thing had been a scam. But by the next day, the winner had been identified as A.H. Lee of Prairie du Rocher, Illinois. Everyone was eager to get a look at this lucky fellow. When contacted, Lee said his wife was sick, and he couldn’t make the trip to Chicago. Then, a few days later, Crosby made another announcement. It seemed Lee was publicity shy. He had come into Chicago secretly and received the deed to the Opera House. Then he had sold it back to Crosby for $200,000. The public had bought over $1,000,000 in chances on a $700,000 building. Subtracting the $200,000 given to Lee, Crosby had paid off the construction costs, pocketed a $100,000 profit, and still had the Opera House. And of course, there were questions whether A.H. Lee even existed. Shortly afterward, Uranus Crosby left Chicago and settled in Massachusetts. 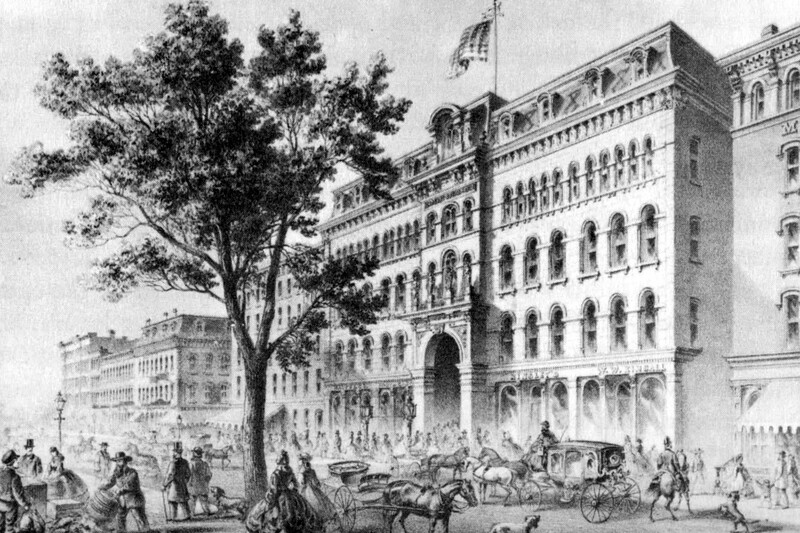 His Opera House was destroyed in the 1871 fire.